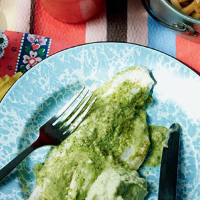 Allow marinading time for this yummy summer fish dish. In a blender, blitz the marinade ingredients; pour nearly all of it over the fillets. Chill for 1–2 hours. Purée the avocado flesh with the remaining ingredients until smooth; season. Heat a frying pan until very hot; cook the fish skin-side down for 4 minutes, then on the other side for 1 minute more. Serve it with the avocado cream and a little of the remaining marinade. Delicious with homemade fries.